Why the musician and filmmaker John Cohen still thinks that true objectivity is an elusive beast. 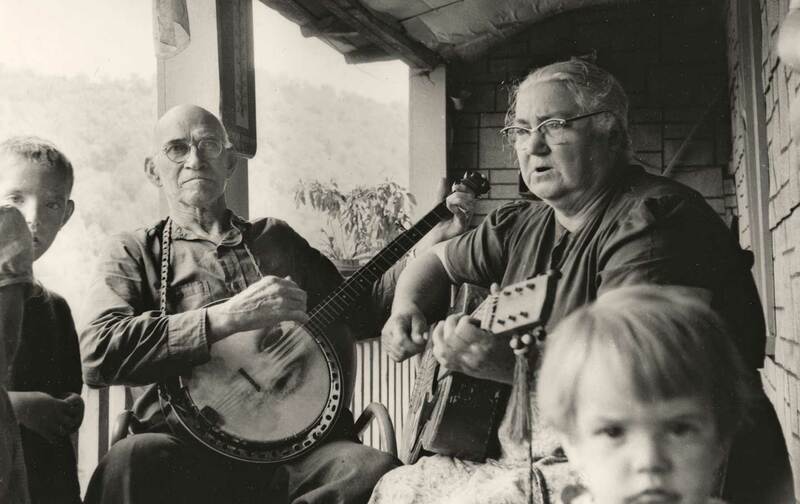 John Cohen, Mr. and Mrs. John Sams, Combs, KY, 1959. “Can I add something to your mix?” asks John Cohen after I tell him that I’m attending the Big Sky Documentary Film Festival in Missoula, Montana, to write about it. At the time, I was new in town, having just moved there from London, England, and was finding my footing by writing about the place. “Yes, please,” I reply. After all, this is the man who introduced the great banjo player Roscoe Holcomb to the world, photographed Bob Dylan before anyone else, and was the stills photographer for Robert Frank and Alfred Leslie’s iconic 1959 film Pull My Daisy. Of course I want his feedback. “What is documentary?” he says, fixing me with a razor-sharp look. “I think it’s changing at the moment. In flux,” I answer, thinking about the award-winning Canadian interactive documentary Highrise and the other i-docs I’ve recently sat through, headphones clamped over my ears, clicking around screens to unveil stories with no beginning, middle, or end. When Cohen was living in New York City in the 1960s, along with Jack Kerouac, the Maysles brothers, and Robert Frank, the idea of authorship and objectivity was being explored and expanded. Cinéma vérité had established limits because it didn’t conceal the presence of a camera, and yet it was understood that trying to erase the director’s presence resulted in another series of formal problems. True objectivity is an elusive beast. “I want to feel the filmmaker in the film,” Cohen says. “Yes,” I say and fall silent. The work of John Cohen is all about experience and has nothing to do with the mess of facts available on our iPhones. But now that we’re firmly in the age of information, documentaries have become more concerned with delivering “content” than with sharing a human response to a subject. And with the rise of i-docs, choice is what it’s all about, allowing viewers to select preprogrammed narratives at the touch of a button. We are all authors now, as we navigate the brave new world of interactive documentaries. It takes me a second to remember that Cohen is 82 and, with Mike Seeger and Tom Paley, a founding member of the New Lost City Ramblers. Formed in 1958, the Ramblers ignited the old-time music revival by bringing the rural vernacular music of the South to audiences whose knowledge of folk music didn’t stretch beyond the Kingston Trio. Not only did they bring the music of the people back to the people, they also managed to get near-forgotten performers to play live around the country, sharing the stage with the likes of Clarence “Tom” Ashley, the Stanley Brothers, Maybelle Carter, Elizabeth Cotten, Dock Boggs, and Roscoe Holcomb. The New Lost City Ramblers were very much on the scene when Bob Dylan arrived in Greenwich Village from Minnesota. Cohen told me of a clip he’d found of Dylan, which he’d filmed on a rooftop in 1962. He was testing the camera that he and Robert Frank had just bought from the Maysles brothers in order to make his first film, The High Lonesome Sound (1963). The sound recorder was broken, so the clip was silent. Over two minutes of raw footage, Dylan seems to channel Charlie Chaplin as he playfully tries on a variety of hats plucked from his guitar case. My first exchange with Cohen reverberated long after that opening-night party at Big Sky. It turned out to be the first of many rushed conversations over several days, between screenings of his films and over cups of coffee in the lobby of the Wilma Theatre, or sitting by the stage at the Top Hat in Missoula. The film’s images possess and haunt the viewer. A miner, smoking a cigarette, crouches into a wagon as it delivers him underground. What looks like fog rolling across lush, ancient forest turns out to be coal smoke. Children play in wheelbarrows and dogs scamper in the background as men, smeared in soot, wander home from the mines. Girls in pretty dresses skip through the grass. In the Holiness Church of God, men and women cry out and feel the Holy Spirit as it absolves them, comforts them, and releases them from life’s pain. Flannery O’Connor’s hardscrabble world is momentarily given life. The music that Cohen captures—whether the singers in church or Roscoe Holcomb on his porch or the Shepherd family around their dinner table—is the connective tissue that links the mines, church, and people in this part of America, which in 1963 already looks and feels very forgotten. Towns with names like Hazard, Lynch, Viper, and Defiance, and a lane called Lonesome Mountain Road, all make an appearance, the names themselves pointing to a past and present as far removed from Greenwich Village as possible. His face is serious and thin, marked by lines etched in a pattern of worry, work, and sorrow. It’s the countenance of William S. Burroughs drained of self-consciousness. Holcomb’s penetrating voice tells of a hard life and a deep soul. One of the finest banjo players to have ever lived, he speaks like a philosopher and sings from a place that seems almost untouchable. The songs themselves are old, and yet in their purity and simplicity they come across as timeless. Seven years after The High Lonesome Sound, Cohen made The End of an Old Song (1970), about unaccompanied ballad singers in North Carolina. One of the greatest of these was Dillard Chandler, from the town of Sodom. The film opens with Chandler in his spartan cabin, saying he isn’t too lonely because every now and then he goes to town and takes a woman out and maybe keeps her for a day or two. Chandler tells us, “My address is Route 3,” and then adds that he has no mailbox and no use for mail. This is a land where people have no bank accounts. It is impossible to imagine, in our hyperconnected age, such acute physical isolation—and yet, for all our connectivity, many of us also live alienated lives. In one extraordinary scene, Chandler goes out to find a companion for the night. He meets a dark-haired woman in a bar. We can’t hear their conversation, but in a voice-over he tells us, “All my good times are past and over.” Then he stares at the jukebox, which has been playing Merle Haggard and George Hamilton IV. “Is this the future?” he seems to ask. When the woman he’s been talking to slips away to sit with another man, Chandler’s face is that of a character from one of the ancient ballads he sings with such longing. This is a document of life being lived as art. Cohen tells me a story about being the “good little filmmaker”: After he finished The End of an Old Song, he went to North Carolina to show it to the people who were in it. The film started, and Cohen noticed that Chandler wasn’t in the audience. He became worried that he was portraying Chandler in a bad light to his community. But when Chandler talks in the film of getting a girl for a night or two, men in the audience began shouting out, “Dillard, you tell it like it is!” This is also documentary. To wrap up the festival’s weekend retrospective of his work, Cohen took to the stage with Scrapyard Lullaby. They played “Jenny Jenkins,” “The Girl and the Snake,” and “The Coo-Coo Bird,” among other traditional tunes. He told me he was going to sing a song he had written in Missoula 40 years ago, when he was playing with the New Lost City Ramblers. He had been here for some kind of “cultural event” (spoken in the tone of someone who is not in favor of manufactured culture) and was taken to see a church on a nearby reservation. He said he couldn’t sing the song here all those years ago, but felt that Missoula was probably ready for it now. “I liked the Indians, but I hated that church,” he told me. Cohen sang the song a cappella. It tells the story of how the church had been painted with holy scenes. Someone realized that the figures in the paintings were white—not a native face to be seen. So a painter was brought in to add some Indians: They were portrayed as those writhing in the flames of hell. All these years later, Cohen’s anger is still palpable. Yet this anger somehow never dominates his work. It simmers quietly, giving his work its urgency and potency, even as his films and songs convey a respect for the ability to weather injustice and heartbreak. At the very end of the last evening, someone asked Cohen to name his favorite creative act. “Inhaling and exhaling,” he replied without missing a beat. To me, that fleet-footed response captures what John Cohen’s work is all about: not just being alive, but being alive to all the possibilities around him. What more is there? Joanna PocockJoanna Pocock is a Canadian writer currently based in Missoula, Montana.